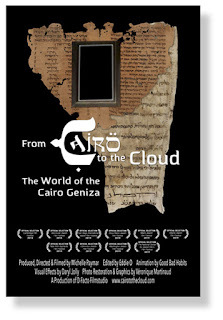 I received an email this morning about a 92-minute documentary telling the story of the Cairo Geniza from discovery to upload on the cloud. I've not seen it, and the DVD does not appear to be too cheap. But the trailer (posted below) certainly makes me want to view it soon. In 1896, Talmudic scholar Solomon Schechter entered the sacred storeroom - or geniza - of an ancient synagogue in Cairo and discovered a vast collection of manuscripts that has revolutionized our understanding of Jewish history. Composed of religious texts and medical prescriptions, literary treasures and love letters, marriage contracts and business reports, magical amulets and children’s drawings, the Cairo Geniza reveals every aspect of society, from the impoverished beggar to the celebrated scholar. Among the most striking of the Geniza’s many discoveries are hand-written drafts written by Moses Maimonides himself, the legendary 12th century rabbi, scholar, philosopher, and physician. Larger, more varied and, arguably, more significant than the Dead Sea Scrolls, the half million fragments of the Geniza open a window into a vanished civilization that illuminates over a thousand years of Jewish, Christian and Muslim life at the heart of the Islamic world and testifies to a “golden age” of relative religious tolerance nearly unimaginable today. After their discovery, the documents were dispersed among seventy different libraries and collections world-wide. Today, however, thanks to an unprecedented international effort, these archives have been digitally re-united. After a thousand years of silence, the Geniza has journeyed from Cairo to the cloud where it is freely accessible online to everyone, everywhere. From Cairo to the Cloud tells this extraordinary story, the vital society the Geniza reveals, and the efforts taken by an international consortium of archivists and digital experts to bring these ancient manuscripts into the modern world. From Cairo to the Cloud - Trailer from D-Facto Filmstudio on Vimeo. "After a thousand years of silence, the Geniza has journeyed from Cairo to the cloud where it is freely accessible online to everyone, everywhere." Looking at the link there is a mention of 400,000 images covering 98% of the fragments, but I was unable to see on the link where the images are accessible. Anybody able to advise how to access the images? I've seen the film twice. It's fascinating and entertaining, though relatively little space is given to the significance of the biblical materials in the Genizah. The web address above is correct; one simply needs to create an account (which is free) and then all the images can been viewed. There is also a Genizah app: on Google Play Store just search for Cairo Genizah. The app is excellent for just checking an image quickly (provided one knows the classmark one is searching for). In 2017 the UL put on a really superb exhibition of some aspects of the Genizah world. The site above gives an online 'distillation' of that exhibition. Thanks, Kim, for the helpful comment. I was unaware of the Google Play Store app.